We deal with all your reservations personally to be able to meet your indiviual requirements. Call us, send us an e-mail and we will be happy to check room availability. Send us a email with your preferred dates and you will receive our response within one day. Or call us direct under +33 6 85 88 95 63 and we will be happy to check room availability. Depending on your choice of room the prices range between EUR 140 and 170 with two nights minimum stay. A supplement of EUR 25 per room will be charged for single night stays. For stays of more than one week we offer a discount of EUR 10 for any additional night. With your reservation a 30% advance payment for the booking is required. We offer to organize individual activities according to your requests and can arrange transfers to and from the nearby airports and railway stations. 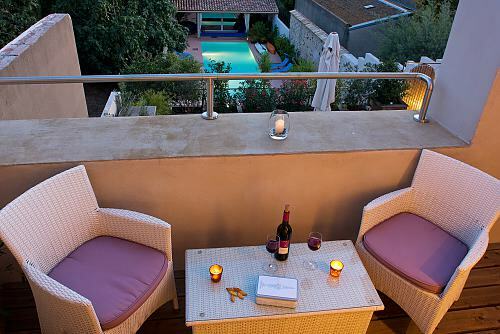 Each room has balcony or private terrace, all interior areas are non-smoking, pets on request.